With today’s Internet-connected devices, people expect to always be informed of what’s going on. Control4 smart security delivers on that and more. Naturally, you can call up a video feed from a security camera on a smartphone with the Control4 App. When inside the house, the video feed can be seen on a TV screen or a Control4 Touch Screen. But there is more. If your home is equipped with Control4 Touch Screens, you can communicate with the babysitter that isn’t picking up a call. 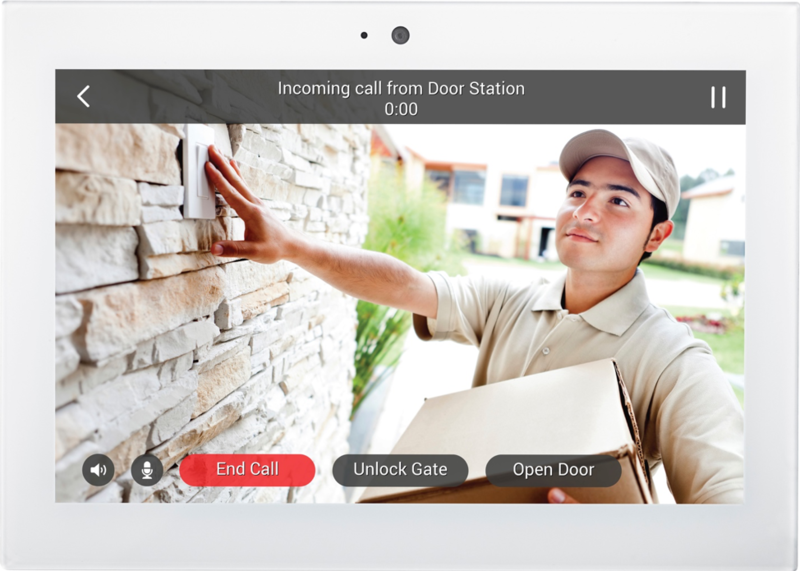 The Control4 App can connect you directly to any of your home’s Touch Screens for voice and video calling through Control4’s Intercom Anywhere. It’s a smart way to keep in touch with kids, elderly relatives, or anyone else when mobile devices aren’t available. If you employ smart locks, you can always know whether your doors are secured. If they aren’t, the touch of a button can lock them. If you need to let someone in temporarily, you can see and communicate with them via the Control4 Door Station video intercom/doorbell, when you’re home or away. Did someone leave the garage door open? No worries, you can close it from anywhere. Naturally, you can receive any alerts that you find useful. You can be alerted when someone is at your door, when there is motion detected on a security camera, and when a door lock has been opened. You can always know who is at your property and what is happening there, in case you need to take action or simply keep an eye on things. One unique feature of Control4 security is Mockupancy, which manages smart functions in your home to make it look like you’re there when you’re not. A Control4 smart home system can learn your usage patterns for smart lights, automated shades, and even AV systems and simulate those when you’re away, so your home looks occupied while you’re on vacation or just out for the evening. Mockupancy mode is not a pattern that turns on a light at 2 AM; it intelligently analyzes and imitates your history to make it difficult for any potential intruder watching your home to figure out what’s going on. Smart sensors can monitor environmental conditions and alert you if something is amiss. With a water sensor, you can be warned of a leak from a basement or utility room pipe and take action before the minor leak becomes an expensive flood. Similarly, a temperature sensor can alert you that the wine room refrigeration is not working correctly, to ensure that your valuable wine collection is not compromised. Beyond alerts, the system has the intelligence to do more to protect without your intervention. If an intruder does break in, a sensor or camera can trigger all the lights to come on simultaneously as well as trigger a siren, which would be a sure way to startle the perpetrator. If a smoke sensor were to go off in the middle of the night, the Control4 system could light a path to the doors, turn off the HVAC system to avoid spreading smoke and flash the outside lights to help firefighters quickly locate your house in the dark. Control4 smart home security does more than just alert you to trouble. It keeps you connected to your home, putting you in control, and has the intelligence to help you manage the situation too. That’s delivering true peace of mind. To find out more about how Control4 smart home security systems can protect your home, contact us today!